We can learn a lot from animals and their interactions between each other and their habitats. Ecosystems rely on a healthy balance between the organisms in each trophic level. Globally, human disturbance has been the most influential aspect of altered ecosystems. Commonly mistaken for a bull frog, the green frog has 2 lines that run posteriorly from the ear drum to the hind legs. Bull frogs don't have such distinguishable lines. Similar to many frogs, they will eat pretty much anything that will fit in their mouth. Green frogs are generally one of the most abundant species of frogs in areas they inhabit. Located at the Green Swamp Preserve in Eastern North Carolina, there were large numbers of pollywogs at the edge of the pond. There were so many it was difficult to walk around the waters rim without stepping on one. I don't have an ID for this species, due to not being able to find any adults. Native to Central America, Ctenosaura similes has also been introduced to the United States in parts of Florida. They have been recorded as the fastest running lizard on earth. Ocypode quadrate is the only species of ghost crab on the Atlantic coast of the United States, with its range extending down to southern Brazil. This makes them easy to identify. They live in burrows in the sand above the strandline, and are mostly nocturnal. They're funny looking compound eyes can swivel to give them a 360 degree view. 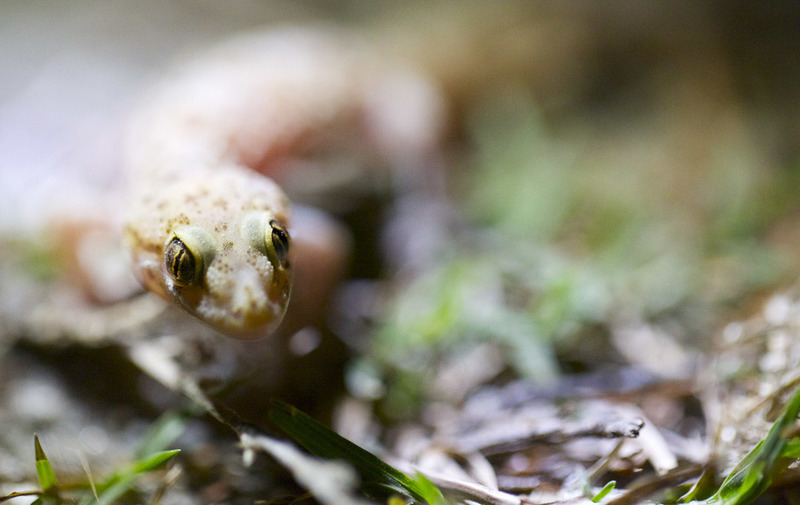 Taken at St. George Island State Park, Florida, mediterranean geckos have occupied many parts of the world but generally aren't considered invasive in areas where they are introduced because they don't have a negative effect on local populations of other species. They are nocturnal animals and feed mostly on insects. Shot on Marathon Key, FL This green iguana was emerging from a bush after heavy rains. Green iguanas are an invasive species to Florida, and cause problems for home owners by eating plants and vegetables in their yard. Hermit crabs have compound eyes located on movable stalks. Their eyes have faceted lenses which are especially adept at picking up fine movements. Horseshoe crabs mating on a sand bar in the Chesapeake Bay. Horseshoe crabs have been on the planet for an estimated 300 million years. Approximately 100 million years before the dinosaurs. Once they find a mate, males will hook their pedipalps (specially modified clawed appendages) to the female and she will drag him to the waters edge where she builds a nest 4-6 inches deeps. The female will deposit up to 20,000 eggs in one spawning event.